The dog days of summer are upon us and Ashley and I are sweating it out in the fields. We’ve been so thankful this year to have the help of some pretty awesome people. First up, our employee Reed who is a harvest master and does bike delivery to our restaurant clients. And our intern Erin who just graduated from college in Colorado and moved here to work with us! We couldn’t do it without them and the help of our awesome volunteers who are too many to name. Thanks folks! 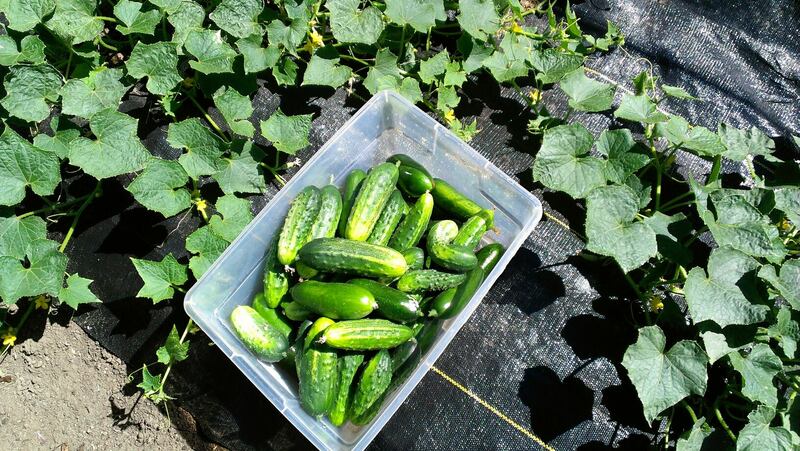 Veggie of the Week: Cucumbers! Toss the cucumbers, dill, olive oil, lemon juice and salt together in a medium bowl. Let sit for at least 20 minutes tossing gently once or twice along the way. In the meantime, cook the tofu. Cook the tofu and a pinch of salt in well-seasoned skillet (I’ve been trying to stay away from non-stick) over medium-high heat for a few minutes, until the pieces are browned on one side. Toss gently once or twice, then continue cooking for another minute or so, until the tofu is firm, golden, and bouncy. Set aside. Just before serving cut the avocado into cubes. Spoon the cucumbers out of the lemon-olive oil mixture into a large salad bowl. Add half of the remaining dressing, the tofu, and half of the pine nuts. Gently toss. Taste. Add more dressing or salt if you like. Sprinkle the avocado across the top of the salad and gently toss once or twice to distribute it throughout the salad. Serve topped with the remaining pine nuts. Puree the melon, chopped cucumber, and mint in a blender until smooth. Strain through a fine-mesh sieve into a large pitcher. Add the lime juice and sliced cucumber. Chill for 30 minutes or up to 12 hours. Stir well before serving. Serve over ice, garnished with lime slices. Add a splash of gin, if desired.